The CALIFORNIA AIR TOOLS 60040DCADC Ultra Quiet, Ultra Dry Oil-Free Air Compressor with Air Drying System is designed to be one of the quietest 4.0 Hp air compressors in the industry having only 75 decibels of sound. The Powerful (2) 2.0 HP motors operates at only 1680 RPM creating less noise and less wear. The SP Series of Ultra Quiet Air Compressor Motors have been designed to increase duty cycle and allow for longer continuous run times. The CAT-60040DCADC Air Compressor has a Oil-Free Dual Piston pump designed to have a life cycle before wear of 3000 Plus hours compared to other comparable air compressors with life cycles of 1500 hours or less. The Oil-Free pump allows for use in a variety of temperatures (cold starts) and eliminates oil from being in the air. The large 60 Gallon ASME Certified Steel Air Tank is just the right size for shop or garage. Good for commercial use. The Air Dryer is specially designed to remove up to 98% of the water vapor from the air to protect sensitive tools and machinery. 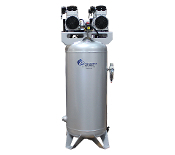 The aftercooler is a heat exchanger for cooling the discharge air from the air compressor. The water vapor from the compressed air is condensed into liquid form and pushed into the Air Dryer. The easy to replace "Spin-On" Air Dryer Cartridge has a regenerating High-Temperature Molecular Sieve Desiccant to dry the air. This cartridge dryer has a life of 2-years before replacement. Designed for the person looking for Power, Dry Air, Air Flow and Less Service with at Least 30% Less Noise! * Oil-Free Pump (Class 1) – Cleaner air for better tool operation. * 60 Gallon ASME Steel Air Tank for Commercial use. This product has Blemishes such as paint discoloration, scratches, dents or rust.